There’s a glistening green glob on my plate. The waiter called it a sphere, but that’s not really an accurate description. Spheres are spherical, and this…isn’t. More like an egg yolk. An egg yolk from Dr Seuss’ kitchen. “Liquefied pea sphere, sir,” he said, obviously missing the redundancy of liquefying an already spherical item to reconstitute it into a not-quite sphere. I briefly considered, then decided not to trouble him with my thoughts, and instead set my mind to the task of conveying the pea sphere from plate to mouth while maintaining its structural integrity. How did I get here? When did dinner become so complicated? Let’s dial the clock back a bit and talk about…. ….Molecular gastronomy. Yes, I know you’ve heard all about it, with the gels and the foams and the liquid nitrogen; you’re not the only one who watches MasterChef. You probably also know that some of the most famous chefs associated with this style of cooking (Ferran Adrià, Heston Blumenthal, Thomas Keller et al) don’t really care for the term ‘molecular gastronomy’ so they call it ‘deconstructed’ or ‘modernist’ cooking. Closer to home, Mr Bachchan has spent years trying to get people to say ‘Indian Film Industry’ rather than ‘Bollywood’, but it hasn’t happened yet. In the meantime, since I’m the Bollywood actor sitting here with a liquefied pea sphere in front of him, I’ll just keep referring to it as molecular gastronomy so we’re all on the same page. I first heard the phrase about three years ago, in an article on Ferran Adrià’s restaurant elBulli. They said it was the greatest restaurant on Earth. They talked about foods that look like one thing, but transform when you put them in your mouth. Carrot air, liquid olives, smoke foam…what could these things possibly be? I was fascinated, but in a purely academic sense. I had no real inclination to try these strange dishes; I’m something of a traditionalist. Give me a tender steak with roasted potatoes, or a hearty Bolognese and I’m happy. Carrot air ain’t going to fill my stomach. I think I would have gone a much longer time without ever giving this kind of food a chance, were it not for a friend of mine. I happened to be going to Bangkok for a shoot, and he told me I simply had to go to his friend’s restaurant. “Indian with a twist,” he told me. “You’ll absolutely love it.” I wasn’t so sure. I mean, who travels to Bangkok and eats Indian food? But I was kind of stuck. It would be rude to refuse, so I resigned myself to an evening of chicken in tomato and fenugreek gravy served with rice pilaf and Indian lentils tempered with cumin. Boy was I wrong! The restaurant I was sent to was Gaggan, run by Gaggan Anand. And the food absolutely knocked me sideways. Tandoori lamb chops that hadn’t been near a tandoor; instead, they were cooked sous vide (vacuum sealed in a pouch, and cooked for hours in a water bath), then finished off with a blast of smoke at the table. Paani puri in white chocolate puri shells… sounds crazy, right? They’re delicious. Long story short, I ended up having one of the most remarkable meals of my life, and making a new friend in the bargain. 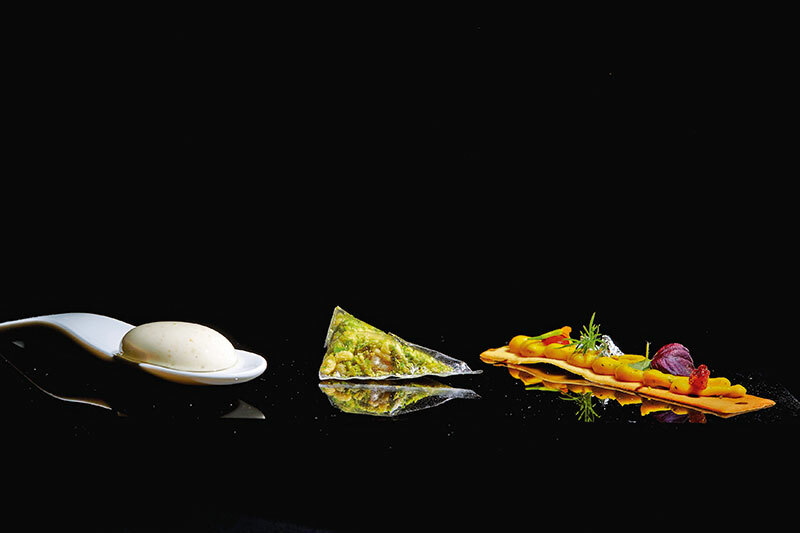 That came into play a couple of months ago, when Gaggan made a trip to Mumbai. 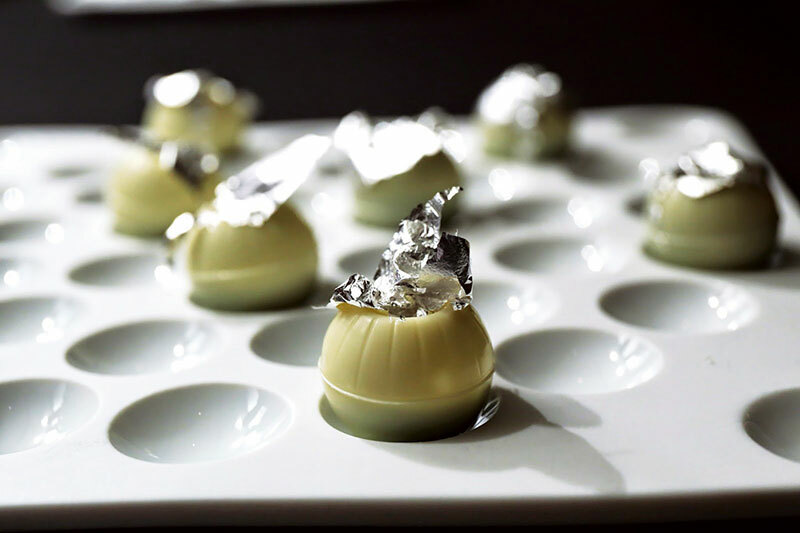 Deconstructed, modernist, molecular gastronomy, whatever you want to call it. It has an air of elitism about it. It’s clearly fancy food for fancy people who will eat it in fancy restaurants while discussing the terroir of the wine and the textural counterpoints versus the acid components of the meal. Probably wearing fancy hats while they do it. At least, that’s the general image. And if there’s one thing I love, it’s shattering preconceived images. Gaggan set up a food truck in the compound of an office complex, where he planned to give out samples for free, and he asked if I’d like to come along. Hordes of people turned up, regular office-going folk, drivers and watchmen, anyone who happened to be in the complex at the time. They tried things they’d never heard of, and that anyone in their right minds would be suspicious of: paani puri in white chocolate shells, dahi papdi chaat spheres (no, these didn’t look like spheres either) and microwave dhoklas, lighter and fluffier than you could imagine, served with coconut chutney foam… and they loved it! They laughed when the globs of dahi papdi chaat exploded in their mouths Their eyes widened as the sweetness of the white chocolate soothed the burn of the paani puri. In short, they got it. Just like I had got it when I first tried Gaggan’s food. He doesn’t want to be exclusive; it’s not about impressing food critics with artfully manicured facial hair. It’s about taking flavours that are familiar, and presenting them in a new and unexpected way. Food that looks like nothing you’ve ever tried, but tastes comforting and delicious. Depending on who you listen to, it may be the way we all cook in the future, or it may be a fad that will vanish in a few years. I honestly couldn’t say. What I do know is that this is an exciting time for food. 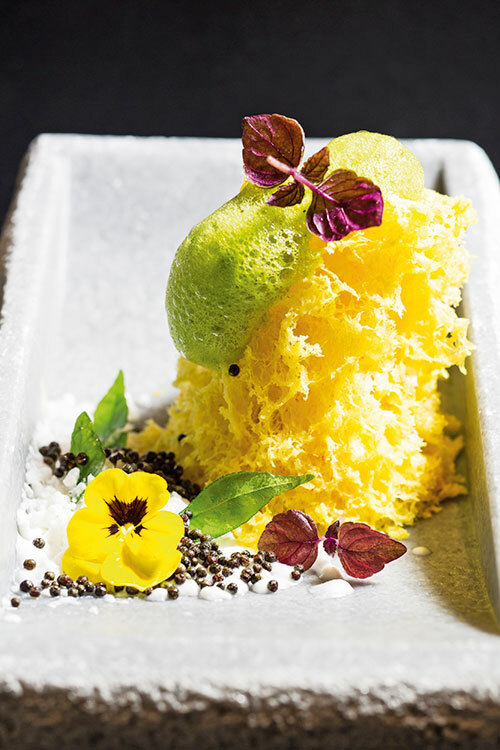 Talented chefs are pushing boundaries every chance they get and that’s always a good thing. Well, almost always. Sometimes you just end up chasing an uncooperative pea sphere around your plate.